Nolan’s Ridge in Mount Arlington, New Jersey is a magnificent 55+ community just minutes away from Lake Hopatcong. Brookland Partners completed construction on this active adult community of low-maintenance condos and single-family homes in 2014. Homeowners throughout the community enjoy a hassle-free lifestyle that offers residents more time to enjoy the recreation and activities found throughout the beautiful community and Morris County. The beautiful 6,700 square-foot clubhouse is always buzzing with activity. Inside of the welcoming clubhouse there is a great hall, catering kitchen, locker rooms and billiards room. Residents can work out in the exercise room, embrace their creative side in the arts and crafts studio, or get competitive in the card and game room. Nolan's Ridge also provides wine lockers for properly storing or aging your favorite bottles. Outdoors, residents can bask in the sun in the pool. There is a clubhouse patio that is the perfect setting for get-togethers in the summer months. In addition, residents can participate in a match on the tennis or bocce ball court. The community also provides a walking and biking trail for a quiet evening stroll with your significant other. Construction began in 2008 on 60 single-family homes and 96 condo units. The Bluffs condos at Nolan's Ridge are located in secure elevator buildings and are offered in eight floor plans that range in size from 1,482 to 1,867 square feet. These condo units feature two bedrooms, two bathrooms and an assigned parking spot in the underground garage. All units have balconies or patios, private storage areas and open floor plans with an optional fireplace. The Peaks are the single-family homes within the community and are available in seven floor plans and range in size from 1,861 to 2,598 square feet. These exquisite single-family homes feature two to three bedrooms, two to three bathrooms, and an attached two-car garage. All homes have ten-foot ceilings, 42-inch kitchen cabinets with crown molding and granite countertops. The diverse mix of styles, floor plans, and price ranges will surely suit your needs. Nolan’s Ridge provides residents with both physically active and socially engaging lifestyle options. Regardless of your passion, you are sure to find other like-minded individuals who share your interests. This 55+ community offers an exciting array of amenities while promoting life-long friendships. The low-maintenance lifestyle allows the freedom to enjoy the clubhouse and the prime location. The residents are constantly gathering for social events like holiday parties, potlucks, and billiards. Special interest groups include the writing group and the computer club. Learn something new with a lecture, challenge your neighbors to a game of cards, or support a charity drive. The clubs and events are sure to keep any social calendar full. 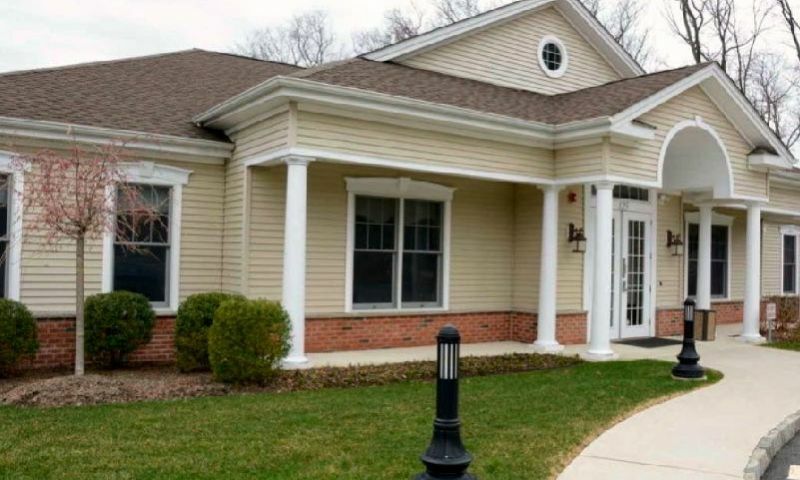 This 55+ active adult community is located in remarkable Mount Arlington, New Jersey and is conveniently close to Route 80. Nature enthusiasts will enjoy the variety of activities that are in close proximity including golfing, fishing, hiking, and biking. Explore the Morristown National Historic Park that contains the Washington Headquarters and Museum, Jockey Hollow, Fort Nonsense, and the New Jersey Brigade and Cross Estate Gardens. Residents can go splurge at The Mall at Short Hills or grab a delicious bite to eat at one of the local restaurants and farmers markets. Exploring the excitement of Manhattan is made easy with a new rail connection from New Jersey. Nolan's Ridge in Mount Arlington, New Jersey is close to everything to keep active adults entertained throughout the Northern New Jersey area. Clubhouse - 6,700 Sq. Ft. There are plenty of activities available in Nolan's Ridge. Here is a sample of some of the clubs, activities and classes offered here. There are 96 condo residences located in The Bluffs. The condos are located in four secure elevator buildings and are offered in eight floor plans that range in size from 1,482 to 1,867 square feet. These homes feature two bedrooms, two bathrooms and an assigned parking spot in the underground garage. All units have balconies or patios, private storage areas and open floor plans with an optional fireplace. The Peaks neighborhood has 60 single-family homes that are offered in seven floor plans and range in size from 1,861 to 2,598 square feet. These exquisite homes feature two to three bedrooms, two to three bathrooms, and a two-car garage. All homes feature ten-foot ceilings, 42-inch kitchen cabinets with crown molding and granite countertops. We have a end unit (Filmore floor plan) condo and we love how light and bright it is. If you are looking here I would highly recommend getting an end unit if you can, I believe it's just the Filmore and then one other plan that you can get on the end. The huge windows are worth it! Everything about the community is very nice. The clubhouse is beautiful and the location is quiet but still close to everything. 55places.com is not affiliated with the developer(s) or homeowners association of Nolan's Ridge. The information you submit is distributed to a 55places.com Partner Agent, who is a licensed real estate agent. The information regarding Nolan's Ridge has not been verified or approved by the developer or homeowners association. Please verify all information prior to purchasing. 55places.com is not responsible for any errors regarding the information displayed on this website.